Display an Update Badge in Firefox | ComTek Computer Services Inc. 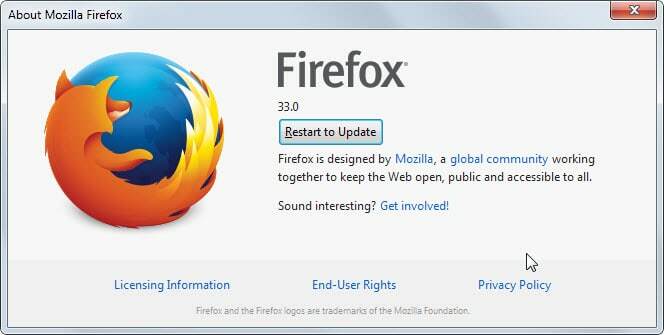 The Firefox web browser is configured to download and install updates automatically. Updates includes the browser engine and core browser files but also extensions and themes. Firefox users who have not modified the behavior don't need to do anything apart from restarting the browser when the prompt to do so appears on the desktop. It is relatively easy to miss the notification and the only indicator that an update is ready for installation is the About Firefox dialog which you can open with a click on the Hamburger menu icon, a click on the question mark, and the selection of About Firefox. Things are a bit different for add-ons and themes as available updates are highlighted on the about:addons page of the browser. A restart of the browser installs everything. There are situations where a permanent update indicator makes sense. It is helpful if the notification has been missed for example and if the browser is not closed down a lot. Another scenario where this may be helpful is if silent updates are configured. 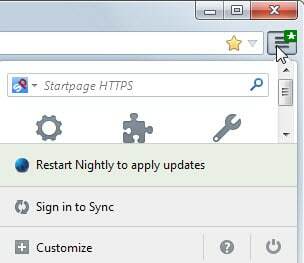 As you may know, you can configure Firefox to suppress all user interface prompts when updates are available. To do so you have to load about:config, search for app.update.silent and set the preference to true. Firefox won't display any update prompts or notifications on the screen when the preference is set to true in the browser. Mozilla has added a new update badge to Firefox 36. You need to enable it for now as it is turned off by default. The badge is added to Firefox's Hamburger menu where it displays update information when an update is available for the browser. A star icon on the menu icon and a new line in the menu when opened indicate the availability of an update. You can click on the row to restart the browser so that the update gets applied. Type about:config in Firefox's address bar. Firefox will from that moment on display update indicators in the menu as well so that you know when an update is available.